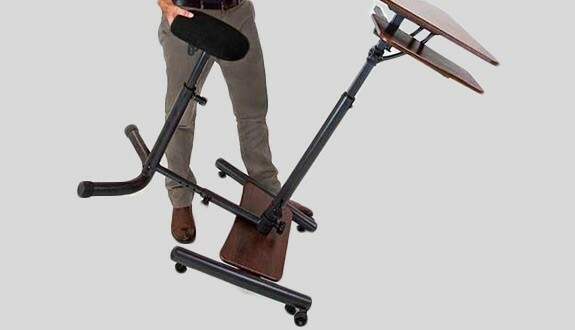 Decrease back pain and improve your posture, energy, and productivity with the Teeter Sit-Stand Desk – a customizable, ergonomic work station that is designed to work with your body and not against it! This height-adjustable standing desk with side table and stool provides a comfortable workspace to sit, stand and keep moving throughout your day. 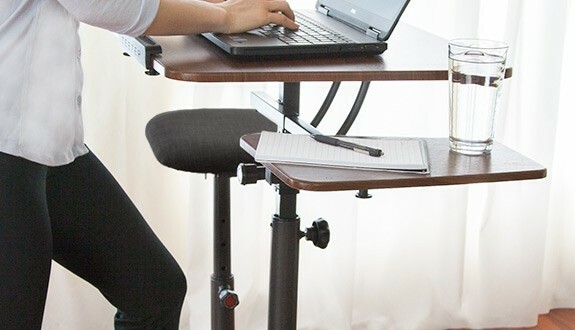 Use as a drafting desk, craft table, or in your office with a laptop or tablet. The heavy-duty, powder-coated steel frame provides a sturdy work surface with seven (7) adjustment features that allow you to easily customize the height, angle, and position. Roller wheels provide for easy transport within your home or office! 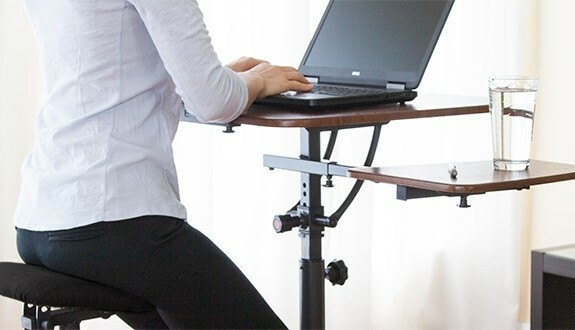 Sit-to-Stand Transition – With its shock-absorbing lift mechanism, the Desktop easily adjusts from 40-46 in. tall to accommodate seated to standing users (up to 6’2”). The Stool adjusts from 22-28 in. and easily swivels out of the way for standing use. Versatile Desktop – Four (4) settings allow the Desktop to tilt between 0-45 degrees to accommodate drawing, drafting, writing, a laptop or tablet. 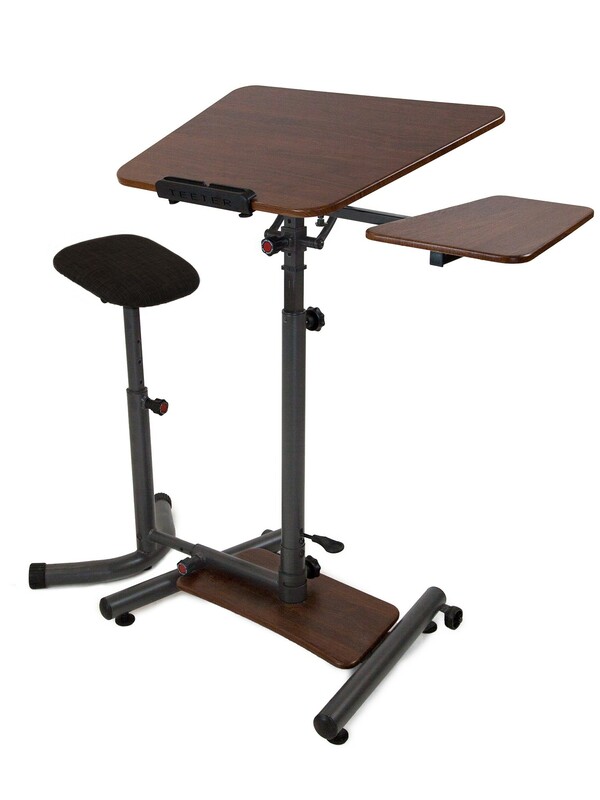 Optimizes Posture – Three (3) settings angle the Stool between 0-30 degrees to ensure comfort while seated. Ambidextrous – The Side Table can be installed on either side of the Desktop for right or left-handed use and offers height and depth adjustments. Auto-Lock Adjustability – Both the Desktop and Stool feature innovative Stabilizer Knobs that spring into your selected setting. Sturdy, Stable Surface – The rust and scratch-resistant, powder-coated steel frame supports up to 150 lb. on the Desktop and 50 lb. on the Side Table. Four (4) Stability Feet accommodate uneven surfaces. 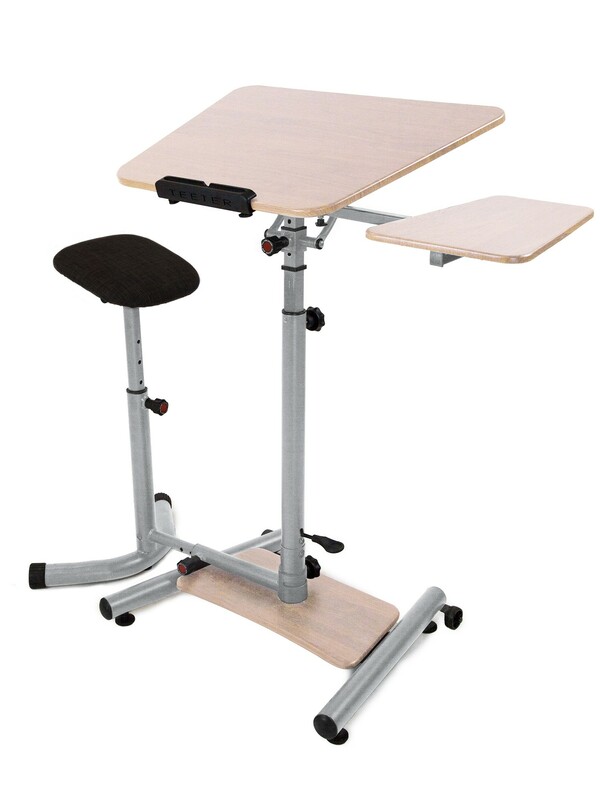 Foot Platform – The Desktop Base doubles as a foot platform to elevate achy or tired feet in the sitting position. Pencil Tray – A built-in compartment on the Desktop allows for storage of a drafting/writing utensil. Quick Transport – Rolling wheels allow for the Desk to be transported or stored out of the way quickly and easily without damage to floors. 3D Interactive Instructions – Access hassle-free, 8-step assembly instructions in 3D with the FREE BILT app for Android/iPhone users.